Run Wrake’s Rabbit – It will make you vegan. 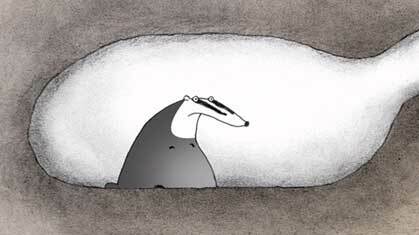 May 30, 2006 · Filed Under Animation Award Winners · Comments Off on Run Wrake’s Rabbit – It will make you vegan. Dimples stumbled across Run Wrake‘s website over the weekend. This guy has some serious weirdness in his head. We love it. First, Dimples must make a small digression. If you’re here, you’re probably looking for animation but the Dimples’ team is broadly educated and wants to point out a strange similarity between Run Wrake’s award winning animation “Rabbit” and the super creepy art brut illustrations of Henry Darger. 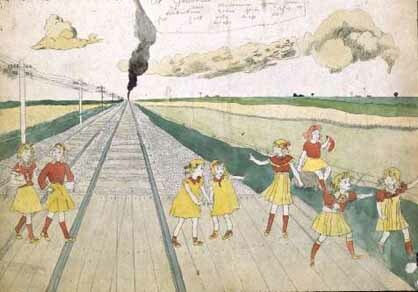 Darger drew small children and, regardless of gender, they all had diminutive male genitalia. He worked as a janitor in a school. He had hypergraphia and he is a darling of art brut collectors. Here are some of Darger’s little girls. Returning to our animator, Run Wrake, here is an image from his short film “Rabbit”. These images are not the best to make the comparison but, trust our dimples, there is a strong similarity in style. “Rabbit” is an entrancing nine minute short that is sure to turn the biggest Whopper sucking red neck into a llama petting vegan. Take a look here. One of the most appealing forms of 2D animation is colored-pencil animation. A master of this type of animation is Bill Plympton. His long career as a cartoonist and illustrator have fostered an animation style that is warm and sketch-like while, at the same time, delivering a raucous surreal punch. Portions of his traditionally colored feature, High Hair, is available here. If you want to see it in person, High Hair will be shown next week, June 8-11, at the Winnipeg Film Festival, Manitoba, Canada. Sharon Colman made Badgered the old-fashioned way on a traditional 2D animation disc mounted in a homemade plywood box. The charming result was nominated for an Academy Award for the Best Animated Short of 2005. The synopsis for the story is “the tale of a badger who just wants the world to let him sleep” but it is much more than that. It’s funny. It’s political. It’s totally engaging. 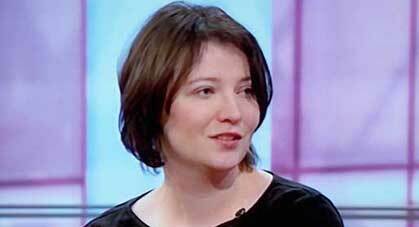 Listen to an interview with Sharon Colman on the BBC. 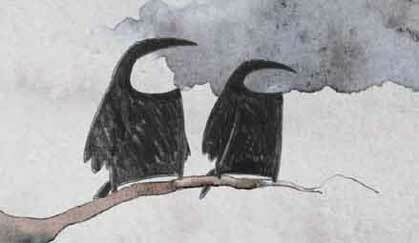 The Dimples’ staff admits they have a decided fondness for the Crows in Badgered. You can see Badgered with Quicktime here. The Dimples’ crew aspire to animate like Hugh Harman and Rudolf Ising. 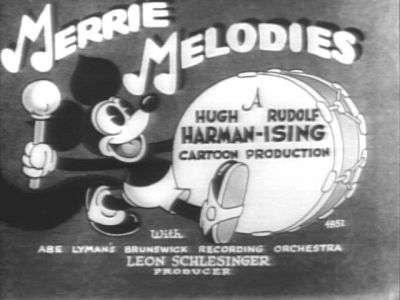 Harman and Ising left Disney when he moved his studio to California. Sometime later they re-joined Disney in California. 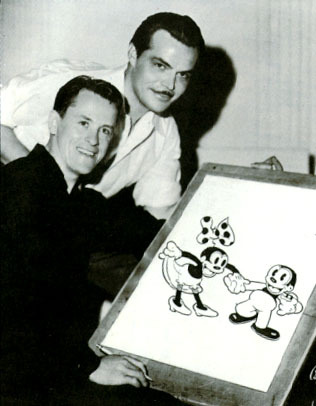 In California, they were part of the team that created Oswald the Lucky Rabbit. After leaving Disney again to form their own studio, they created Bosko the Talk-Ink Kid which was probably the first cartoon to have the speech fully in synch with the animation. 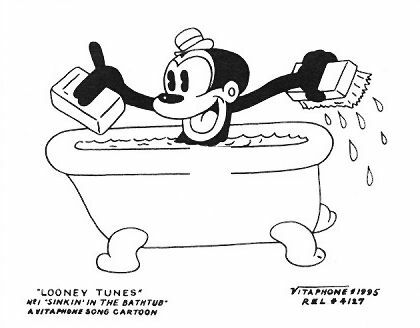 Looking at these animations today, it is sometimes difficult to get past the stereotypical portrayal of black characters but, sadly, this was not an issue to 99.99 per cent of the people running around in the 1930s. This was the beginning of Merrie Melodies. Look at the Mickey doppleganger above. Dimples can’t imagine that the trade mark sharks at Disney would allow something like that to appear today. The groundbreaking Bosko cartoons are available on DVD and are well worth the money to anyone interested in the history of animation. 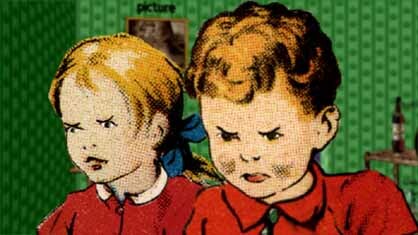 The Inbreds is an interesting new animated cartoon from Cosgrove Hall in the UK. Every tasteless incestuous southern hill-folk stereo-type is thoroughly exploited. As you can see, the locals are more than one chromosome pair short of a full set. The hero of the series is “Jesus H. Christ”. Dimples hopes this series makes it to the states but in the current contentious political climate we doubt that even basic cable would take a chance.